The ICC World Twenty20 2016 is more than half it's age now. 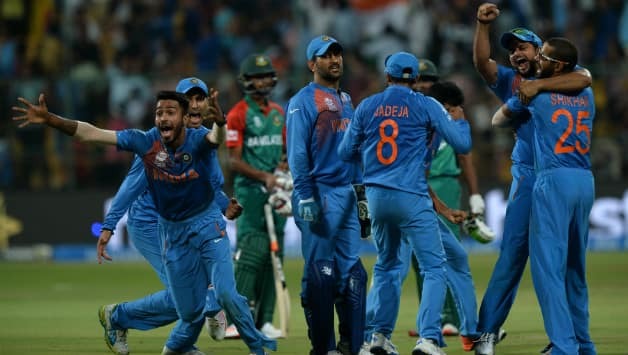 Just when the business end of the league stage was about to begin, just when all the permutations and combinations of who will enter the Semi-finals were coming into play, India and Bangladesh played a match, which was by far the best of the tournament. The match, before it's inception was not expected to be much of a big deal. India returned to form with a win over arch-rivals Pakistan after a defeat in the opener against New Zealand. On the other hand, Bangladesh had lost both their games against Pakistan and Australia. Not that an Indian win was certain. But it was expected from the home team. But who would have thought that the 'win' had to be snatched from the jaws of defeat? Not only from the jaws of defeat, from the jaws of an early exit from the World Cup as well. It was a perfect example of a mediocre movie ending up being a blockbuster. Indian players after winning the thriller. Having won the toss, Bangladesh elected to field in Bangalore. They were boosted with the return of Tamim Iqbal, who became the first Bangladeshi cricketer to score a century in T20 international cricket ten days ago. But his return at the expense of a bowler was surprising to see. Saqlain Sajib's omission from the playing eleven meant that Bangladesh was playing with only 3 specialist bowlers which meant that Mashrafe Mortaza, Bangladesh's skipper had to make sure that he bowled four overs from Shuvagata Hom & Mahmudullah. India enjoyed a decent powerplay until the last ball of the 6th over was bowled. For 35 deliveries, the whole of India was in a notion of a solid opening start which was proved wrong when Rohit Sharma played across the line to a Mustafizur delivery but the slowness of the ball made sure that it went high into the air and straight into the hands of mid-wicket. By the end of the 7th over, even Shikhar Dhawan had made the long walk back to the pavilion. Both the openers' patchy form remains a worry for MS Dhoni and whether he will include Ajinkya Rahane in place of Dhawan will be interesting to see on Sunday, when India take on Australia in Mohali. Even India's foremost batsman in Virat Kohli was not at his peak yesterday. But it is acceptable for someone like him to have an off day. Suresh Raina and Hardik Pandya got starts as well but just like all other Indian batsmen, they too failed to convert it into a big one. When the first inning was curtailed, India managed 146-7, which was some 10-15 runs short of what was expected at the start. But batting was not the only department where Indians were substandard. The first ball of the second innings went past Jasprit Bumrah's legs into the fine leg fence for a boundary. The second last delivery of the first over went past Ashish Nehra's hand (off his own bowling), for what is known as a 'dropped catch' in cricket. The 4th delivery of the fifth over went past Bumrah's hands, for what is known as 'another dropped catch' in cricket. Indians had started to be substandard in the field as well. Dropping the opposition's best batsman twice had it's own aftereffects. The 'karma' of life is such that what you receive is a result of what you've done. The aftereffects were best experienced by Bumrah himself when Tamim hit him for 16 runs in one over taking the Bangladesh total to 45-1 in 6 overs. Not only Bumrah, even Tamim was a victim of 'karma'. If he was lucky twice (when Nehra and Bumrah dropped him), his termination came off a Jadeja delivery which kept low and was an effortless stumping for Dhoni. It might have been an unlucky dismissal for Tamim, but this how 'karma' works. The speed of light in the field of Physics is defined by metres per second. But in the field of cricket, it is defined by 'MS Dhoni'. The most fitting example was when he stumped Sabbir Rahman off a wide ball. It was less of Dhoni collecting the ball and disturbing the LED bails like a flash and more of Rahman loosing his balance. A stumping, which was perhaps never seen before. If Shahid Afridi came up the order to change the course of the game vs India and New Zealand, Mashrafe Mortaza was nowhere behind. He promoted himself to no. 5 but the result was same as Afridi's, both failed to create a significant impact on the game. Mortaza's wicket turned the game in India's favor. But when Shakib hit Jadeja over the cow corner for a maximum in the same over, the face of victory again turned towards Bangladesh. Such is the beauty of low scoring games, every single boundary or wicket get you back in the game. Needing 52 in 8 overs with 6 wickets (including an extra batsman) in hand, Bangladesh was comfortably seated in the driver's seat. Desperate for a wicket, Dhoni re-introduced his best bowling option in R Ashwin into the attack. The reason I called him best is because he got rid of Shakib on the first ball. An over which consisted of one wicket and one run changed the driver's seat as well. Mahmudullah and Soumya Sarkar scored 24 in the next 24 deliveries bringing down the equation to 27 from 18 balls. This was where all the planning and plotting had started. You could see the 'chaos' around Dhoni. People from all parts of the ground came with suggestions. But does a 'chaos' affect Dhoni? No. Never. His cool head may not even be affected by a volcano. The biggest doubt was whom and when to give the remaining one over of the 5th bowler. Nehra bowled the 18th over, got rid of Sarkar but conceded 10 runs. The equation was down to 17 off 12. Bumrah was given a chance to make amends to his earlier lapses on the field. His yorkers did not allow either Mahmudullah or Rahim to score more than a run on any delivery. The ultimate over was about to begin. A smiling Pandya was preferred as the safest option. He conceded a single off the first ball but Rahim scored two consecutive boundaries to bring the equation to 2 runs off 3 balls. A Bangladeshi win was a walk in the park from now. But their batsman preferred to sprint. On the 4th delivery, Rahim hit a full toss straight to Dhawan at deep mid-wicket. Mahmudullah had a chance to not to commit the mistake which Rahim had made. 2 runs off 2 balls. It was still Bangladesh. Only a foolish act could have handed them a loss and Mahmudullah did exactly that. The penultimate delivery was bowled by the same bowler (obviously), same delivery, same shot and same result. The same result was more of a 'shame' for Bangladesh. Even Mahmudullah hit the ball straight to deep mid-wicket. It was as if Bangladesh, after scoring 145 runs, somehow forgot to score the last 2. Shuvagata missed the last ball, Mustafizur ran for a bye, Dhoni ran for a run out chance, the fielders from the boundary ran in anticipation that Dhoni would hit direct. But Dhoni is what Dhoni does. He reached the stumps before anyone else could and made sure that Mustafizur was short of his crease. He probably did not hit direct because he did not want the ball to deflect from the stumps. Perhaps, creating a chance for the batsmen to run two. The Indians were glorified. In the ground, in the stands, in front of TV sets. It was as if the World Cup was won. Such was the intensity of the game. Not just a game, it was a whirlwind of emotions. R Ashwin may have been awarded the Man of the Match. But there can never be one hero for such an encounter. It was a combined effort the bowlers. Pandya defended 10 runs in the last over, Nehra bowled well at the start and suggested well in the end, Bumrah made sure that the match went to the last over, Jadeja picked two crucial wickets and not to forget, Mahendra Singh Dhoni, who was as sharp-witted as he could be. Proving yet again that no amount of pressure in this world can overcome his calmness. Proving yet again that no matter what the result is, his reaction to a given situation would remain the same. Proving yet again that he is as effective behind the stumps as he is in front of them. Proving yet again that India still has a long way to go under him! What a beautifully written post. Never saw cricket from such an interesting perspective.